Eastertime for Christians just passed and the resurrection of Jesus is the big event of the period. I’d like to explore the term “resurrection” in another context: the “rising from the dead” of a society expressed by a woman artist. "Expressionism" was first applied to art from the early part of the 20th century, primarily in northern Europe, and predominantly in Germany. It was a style that articulated the stresses of modern life. Artists working in Expressionism believed that the "form" of the work of art grew out of content. In other words, jagged line and dramatic composition were crucial to expressing the artist's solemn, passionate, and sometimes violent innermost vision. German Expressionism was greatly influenced by medieval art and German Renaissance woodcut prints. Milly Steger’s work reflects a period of great suffering for the German people because of World War I (1914–1918). The movement Expressionism had its inception before the war, but became very articulated during and after the war. “Resurrection,” or “Rising from the Dead,” is most likely not representative of a single individual as much as the entire folk of Germany itself. The emaciated, prone position of the figure reminds me a great deal of Wilhelm Lehmbruck’s (1881–1919) Kneeling Woman with a touch more pathos added. And let’s not forget the most notable woman expressionist of the period: Käthe Kollwitz (1867–1945). 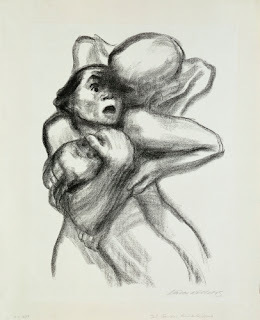 Kollwitz produced a whole series on Death seizing various members of society. This came from the medieval German idea of the Totentanz (Dance of Death) and contemplation on the equality of death. This was her response to the horrors in Germany after World War I.
Steger was born in Rheinberg and studied there, then Düsseldrof, and eventually Berlin. She primarily studied art to be a sculptor. Resurrection is most likely a study for a sculpture. In 1911 she fell under the influence of Karl Osthaus (1874–1921). Osthaus was a great patron of contemporary art and established the Folkwang Museum in Hagen, a city in which Steger was very active, contributing many sculptures. The Folkwang Museum held some of the earliest German expressionist exhibits. 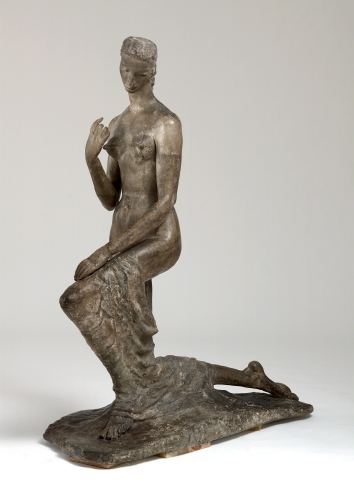 After World War I she was active teaching sculpture and life drawing in Berlin. Das Kunstblatt was a publication that focused on contemporary art in every art form. 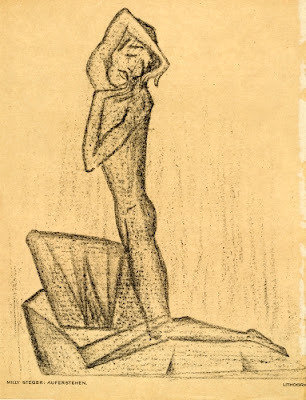 The anguished persona, angular and sharp lines and form, and isolation of the figure all heighten the expressionistic content and place Steger firmly within German Expressionism. Studio activity: Imitating the nuances possible with lithography, draw an imaginary figure expressing an emotion. Use charcoal on heavily textured paper. Remember to consider a consistent light source with which strong variations in light and dark can be exploited. The harsher the lights and darks, the stronger the emphasis on the emotion.